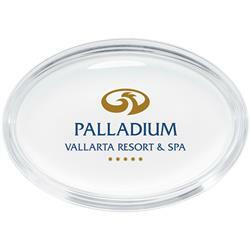 Oval Glass Promotional Paperweights - one of our most popular custom paperweights. Logo is screened and can be screened to appear as a custom etching. 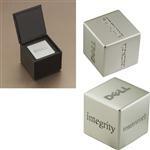 Please ask our experienced staff for more custom and promotional paperweight ideas! **ON SPECIAL**. FREE RUSH AVAILABLE! Typical Imprint Area(s): 1-1/4 x 2-1/4. 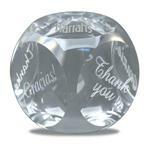 Glass, oval shaped paperweight with 1-color imprint.